Divorce mediations are getting more and more popular in Florida, likely due to the fact that mediation offers separating couples several key advantages that they would not be afforded were they to resolve their issues in court. Moreover, the majority of courts in Florida now require parties to attend at least one mediation prior to being allowed to have a trial on the issues in the case. Mediation often ends up saving couples considerable time and money and allows them to take a more hands on role in crafting their marital settlement agreement. However, some couples are hesitant to agree to mediate simply because they don’t know how the mediation process works. Therefore, the aim of this article is to explain step-by-step how divorce mediations generally progress in order to take some of the mystery out of mediation. Once a couple has chosen to participate in divorce mediation, decided whether or not to have attorneys represent them during the mediation, and have selected a neutral third party to be their mediator, their mediation will likely progress through each of the steps listed below. The mediator may choose not to conduct the mediation in this sequence, and they may revisit previous steps as needed, however each step will ideally be touched upon at least once. Step 1 – The Introduction: Divorce mediators generally start the mediation process by sitting down with the couple and laying a foundation for the rest of the mediation by explaining what can be expected during the mediation, the mediator’s role in the process, and any rules that the couple is expected to abide by. During this stage the mediator will also likely work with the couple to create a list of issues that they would ideally like to resolve during the mediation. This introduction is sometimes done with both parties in the same room together, or done with each party, privately, in separate rooms. How long the parties spend together in the same room during the mediation, if they are in the same room at all, is determined on a mediation by mediation basis. Step 2 – Information Exchange: In order for a divorce mediation to be successful it is imperative that all parties involved are fully informed about each matter that the couple hopes to resolve during the mediation. Therefore, step two generally involves the spouses gathering and disclosing all relevant documents and information (during a divorce mediation much of this information often revolves around the couple’s assets and debts). During this stage the mediator will typically summarize the information being shared and make a list of any additional information that still needs to be obtained. Step 3 – Exploring the Issues: During step three the spouses are generally asked to discuss their needs and desires in connection with each matter at issue. During this phase the mediator will try to facilitate dialogue and understanding between the parties by highlighting common ground that the spouses share. The idea is to help each spouse identify what they want and what they need, and in turn to understand what their spouse wants and needs. Step 4 – Negotiating: Once the issues at hand have been adequately framed and each spouse’s wants and needs have been sufficiently explored the mediator will guide the spouses through a negotiation that touches on each issue that the spouses would like to resolve. Here the mediator will try to help the spouses find resolutions that best address both of their needs and desires. Step 5 – Closing: Once the spouses have resolved all of their issues, or as many as they can a proposed marital settlement agreement will need to be drafted for the spouses to review. 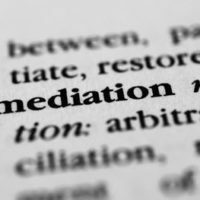 If the couple attends mediation without attorneys, this agreement will often be drafted by the mediator. If one, or both parties attend with an attorney, one of the attorneys will typically do the drafting. If after reviewing the proposed agreement the spouses are satisfied with the outcome they will sign the agreement. If both spouses agree, then their agreement can then be filed with the court and, if the agreement is approved, the court will ratify the agreement, putting the force of law behind it. Additionally, any issues that the couple was not able to resolve via mediation can be submitted to the court for resolution. If you are interested in learning more about divorce mediations in Florida or are looking for an experienced family law lawyer to represent you during your divorce, contact the Law Offices of David L. Hirschberg, P.A. today. Attorney David L. Hirschberg has extensive experience representing high net worth clients and is intimately familiar with the unique challenges that often accompanies these types of divorces. However, regardless of the assets at stake in a client’s divorce, our firm is committed to providing each and every one of our clients with exceptional service and top caliber representation from start to finish. To schedule a confidential consultation at our Boca Raton office call us today at (561) 288-8620.